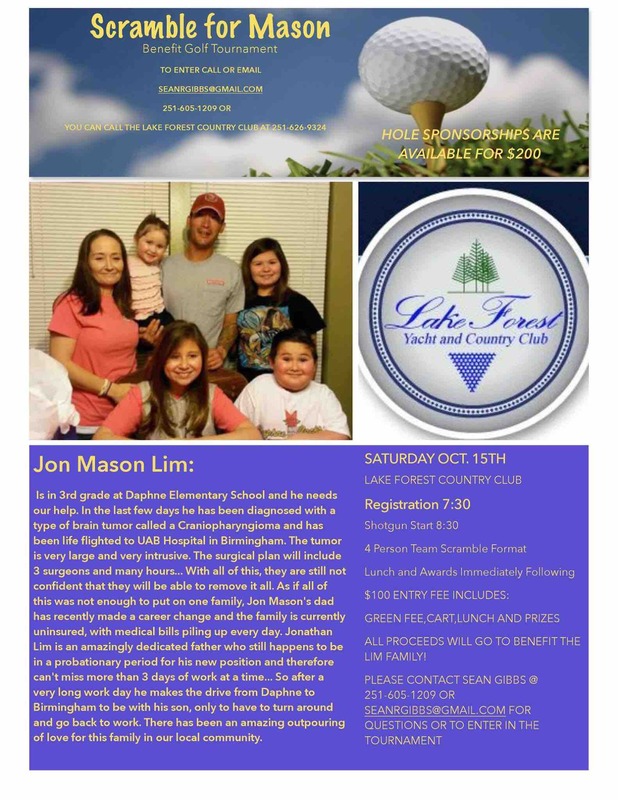 Jon Mason Lim is in 3rd grade at Daphne Elementary School and he needs our help. In the last few days he has been diagnosed with a type of brain tumor called a Craniopharyngioma and has been life flighted to UAB Hospital in Birmingham. The tumor is very large and very intrusive. The surgical plan will include 3 surgeons and many hours... With all of this, they are still not confident that they will be able to remove it all. As if all of this was not enough to put on one family, Jon Mason's dad has recently made a career change and the family is currently uninsured, with medical bills piling up every day. Jonathan Lim is an amazingly dedicated father who still happens to be in a probationary period for his new position and therefore can't miss more than 3 days of work at a time... So after a very long work day he makes the drive from Daphne to Birmingham to be with his son, only to have to turn around and go back to work. 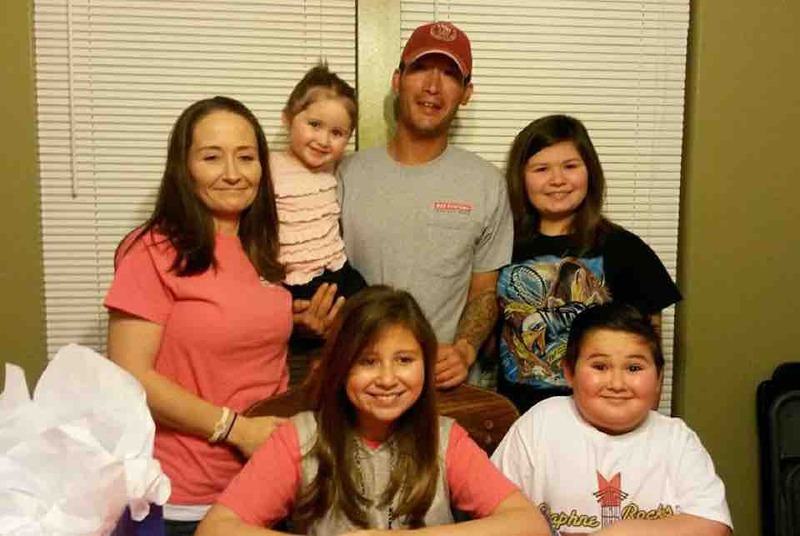 There has been an amazing outpouring of love for this family in our local community... Let's see how we can show our love for them financially. Please share and please donate. Every little bit counts. His aunt, Katie Millwood, will access the funds raised from this account on behalf of the Lim's. Jon Mason will be starting (GH) growth hormone therapy soon and the doctors are telling us it's hundreds of thousands of dollars a year and with his panhypopituitarism he will need it for the rest of his life. Please help lift us in prayer and any financial support for Jon Mason in his journey is greatly appreciated! Share this event! Saturday will be a great day for a game of golf in support of Jon Mason!! I know we haven't posted an update in a few days and I apologize. I'm happy to say Mason is doing better. He is breathing on his own and has been for a few days. He's able to talk a little and drink a little. The doctors are still monitoring his endocrine system, which we expected. If you know Jon Mason though, you know he is in good spirits. Jon Mason was moved from the PICU today to a room on the Critical Care floor (this is good news). They will be monitoring him for a few more weeks in an attempt to get his endocrine system stabilized. He will have another procedure in the coming week or two to remove the packing from his previous surgery. On behalf of the family, I must say we cannot express our gratitude enough for everyone's support! We have been overwhelmed with joy to know just how many people love and care for our sweet Jon Mason. So thank you, from the bottom of our hearts for your prayers, thoughts, well wishes and donations. Jon Mason still has a long road ahead of him, but we are sure with his strength, our God watching over him and the support of this amazing community that he will make a full recovery!! I hope you all have a blessed week. Please continue to share our updates with those who are concerned. We will update as often as we can. Also, the GoFundMe page for Jon Mason has raised over $13,000 already!! These funds will help the family tremendously with the costs, but please don't hesitate to share the link. Although it seems like a lot of money, this is only a portion of what the expenses will be at the end of his treatment. Thank you all again so very much for your support! UPDATE: They are putting him under for an EVD at 1:00 to alleviate pressure on the brain and his eyes. They rescheduled the surgery for Thursday. UPDATE ON MASON! Tonight they decided to put a drainage tube in to try and shrink/drain the tumor to prepare for extraction surgery sometime in the future. Mason has been very sick tonight and his vision is getting worse so depending on how things go tonight he could either get the drain tube surgery later tonight or in the morning. Please pray for Mason, the surgeons, & family. UPDATE on Jon Mason: He is better! He is now back at the Ronald McDonald House. They released them last night. He is still be monitored for his endocrine system. They also tested his thyroid and he will be starting new medication for that. He is walking better and talking more. They will do another procedure next Friday to remove the packing from the last surgery. UPDATE: Mason is out of surgery They could not do the removal surgery The pressure on the left side was too large they drilled a bigger hole in skull and cut a passage way to the left ventricle for drainage The drain is place between the scalp and skull so there will be major swelling They did look at the tumor and have decided that it will need to be done with several more surgeons invoked The removal surgery is scheduled for next Friday at the big UAB hospital They have the equipment and the two more surgeons that they need to do this. Thank you all for your prayers, shares, and donations! We are all working diligently to help as much as possible. Without you all we would never have been able to manage! Thank you again so much! From Nicole: Update on Jon Mason: First I would like to thank everyone for the continued prayers and support you all have so graciously given our family. We truly appreciate it! I would like to fill you all in on what has happened since I last posted an update on October 21st at UAB, his 4th and latest surgery, removing the nasal packing. 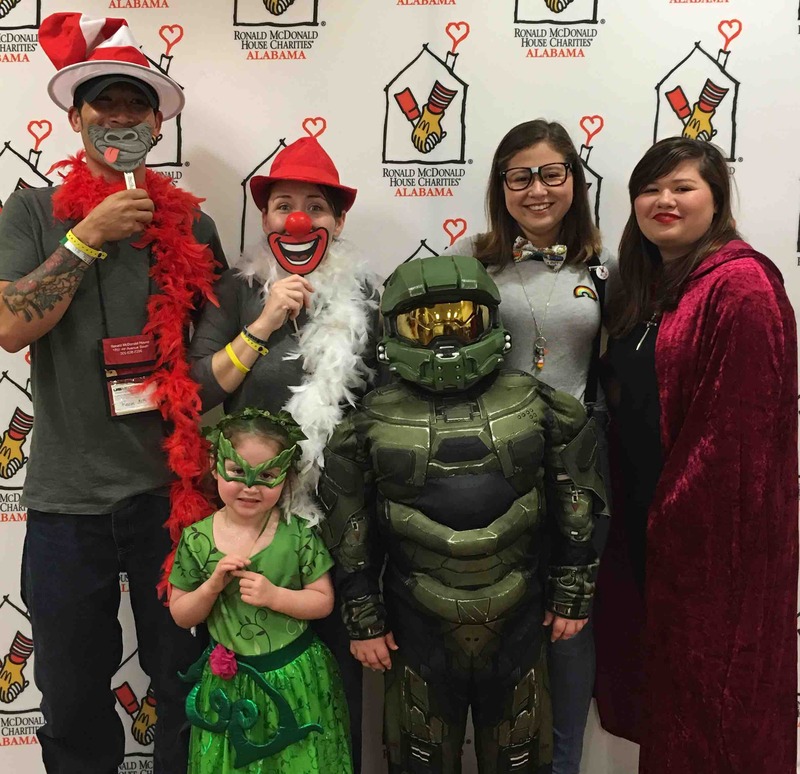 The surgery went well and after a long stay in recovery we were sent back to RMH (Ronald McDonald House). He had an upset stomach that Saturday and Sunday, and late Sunday night he started swelling all over his body. In the early hours on Monday morning we took him to the ER at Children's and he was readmitted. Our stay this time at Childrens revealed the blood work levels on his liver came back elevated and an ultrasound was order. We then found out his liver was enlarged. Researching we now know 50% of all Craniopharyngioma patients with hypopituitarism have some liver disease/dysfunction NAFLD nonalcoholic fatty liver disease. Unfortunately Mason has Panhypopituitarism, which means his pituitary gland has zero function, and diabetes insipidus, which raises his risk. His appointment to see the GI liver specialist will be on December 2nd. On one of our regular check ups with the Neurosurgeons they were very concerned about his sub galeal shunt. If the pockets of spinal fluid don't dissipate by our next appointment on December 1st then they are considering another surgery and putting in a permanent shunt to the belly. Also Mason saw a pulmonary Doctor this week. She said Mason has sleep apnea and this is very common in patients with a history of Craniopharyngioma tumor removal. He needs an overnight sleep study so he can then be placed on a CPAP. The next available scheduled appointment isn't until March. Unfortunately we can't wait that long. Carbon Dioxide is slowly building in his chest so he has orders to sleep sitting straight up. I'm calling everyday to see if they have any cancelations so we can get in sooner. Please keep the prayers coming, we are in much need! On a better note we were released to come home this weekend! He was so excited to be back home in Daphne and be back in his room. We will have to return to Birmingham the end of November but at least we can all be together at home for Thanksgiving! Please pray his health continues to be stable enough to stay home during this holiday time. Again thank you for your caring, love, prayers, and support for my sweet son Jon Mason! We have another update tonight. After speaking with Jonathan (Jon Mason's dad), we found out Mason is doing much better. He is able to walk a little now. His eyes are better and he's able to talk more. This sweet child continues to amaze me. His strength and motivation is something we should all admire!! Let's keep lifting him up in our prayers. Everyone, please continue to share. We have raised $13,400 through his GoFundMe Page alone! Thank you all for your help and support. We couldn't thank you enough!! Praying for complete healing for this precious boy and peace for his family. God Bless all of you!